Summary: FM writer Chet Richards (Colonel, USAF, retired) describes what our military refuses to see, that 4GW has become the dominate form of warfare in our age. That others are mastering it, while we spend vast sums preparing for wars that will not occur again during our lives. And, like all war, 4GW is Hell. See the links at the end for more information. I don’t understand it; our 4GW foes don’t need to. From Prof Sam Liles @ Selil. — A warning by Clausewitz. From On War, Book I – On the Nature of War, Chapter I – What is War? #3 Utmost Use of Force. First generation warfare focused tactically and operationally (when operational art was practiced) on the enemy’s front, his combat forces. Second generation warfare remained frontal tactically, but at least in Prussian practice it focused operationally on the enemy’s rear through the emphasis on encirclement. The third generation shifted the tactical as well as the operational focus to the enemy’s rear. Terrorism takes this a major step further. It attempts to bypass the enemy’s military entirely and strike directly at his homeland at civilian targets. Ideally, the enemy’s military is simply irrelevant to the terrorist. In fact, the will of the enemy population might become the “operational focus,” as it was for the North Vietnamese. So what does this suggest for the role of violence, and in particular, the tendency of the level of violence to escalate? Difficult to say. On the one hand, 4GW opponents, like the insurgents, terrorists, and narcotrafficking organizations from whence they sprang, see violence as a tool for influencing civilian (another term that needs to be reexamined in this type of conflict) populations. More may not necessarily be better, as one may awaken a sleeping giant and fill him with a terrible resolve, to coin a phrase. Looking at 4GW from the perspective of a state participant is also complex. Just killing more members of a non-state 4GW organization may not be an optimal strategy because for one thing, there is the well-known phenomenon of creating enemies faster than you can kill them, and for another, it is, as has been observed many times, difficult to carry out an attrition strategy against groups that espouse martyrdom. It is also possible — van Creveld would say inevitable, given enough time — that indiscriminate violence will alienate your own population, doing the enemy’s job for him, as it were. (which, if it is true at all, does not bode well in the long run for our strategy of drone warfare.) By escalating the level of violence, you may simply be playing into their hands. Balancing all this is the human tendency of wanting to hit back as hard as possible. Consider, for example, the 9/11 attack, which bin Laden considered, and sold to his organization, as retaliation for US actions in the Muslim Middle East: If he had had a nuclear device on that day, would he have used it? So I would not bet on the future of conflict being less violent than it is today. In fact, what has kept World War III from breaking out was not the existence of less violent alternatives, like “cyberwar,” but the threat of immediate and assured destruction by the most violent weapons the world has ever known. It may be, as hinted at by Lind and his coauthors, that the world is groping for a way around this impasse analogous to how maneuver warfare/3GW provided a way out (Boyd’s term) from the terrible increase in destructiveness brought on by the industrial revolution in the 19th century. Note: There is no agreement on the term “fourth generation warfare.” In addition to Lind, et al., and van Creveld, interested readers should consult T. X. Hammes’ The Sling and the Sword. There is also a lot of reference material on the archived Defense & the National Interest website, and scroll down the right-hand column. For more about these issues see If We Can Keep It (PDF here). Also see Chet Richards’ website Fast Transients. Next Post Question time on the FM website. Post your questions and answers! Fabius — RE: Your opening graphic. Don’t feel bad, I don’t understand it either. Several years ago, I did a chart that’s probably equally confusing but I hope more in harmony with Lind’s, GI’s etc. paper. 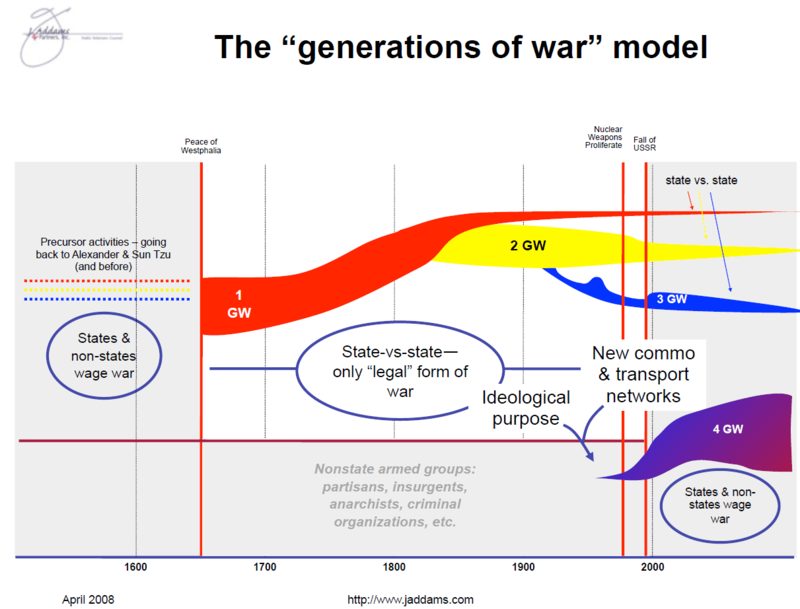 Your readers can download it from the Articles page at Fast Transients, Scroll down to “The Generations of War” model. One difference (just because the chart was getting too complex), both the Lind paper and TX’s book allow for 4GW by state entities. Later, Lind migrated over to characterizing 4GW as “the decline of the state,” which is more like what I have on my chart. The “generationss of war” graphic has been added to the post! The US should be very careful about engaging in 4GW at all. It should only happen when our vital interests are at stake, and when there is no military alternative. At which point we should fight it on its own terms. The experience of Lawrence is strategically relevant here. Part of his method for defeating the Turks was maintaining a wide front and manipulating the organized side’s pride in not yielding territory. The Turks were thus unable to consolidate their forces and leverage their superior training and organization. The relevant corollary here is that we should always strive to narrow the front, both concretely and abstractly, in any 4GW situation that involves vital interests. Minimizing cultural, financial, social and other interactions would be great places to start. Arming for old-school conventional war is absurd economically and therefore should be so politically. Fighting far from one’s home is expensive in terms of the travel and maintenance of troops both before and after victory. Any clash between the US and China, for example, over resources and using conventional forces, will result in both sides losing money. Even the victor will suffer unless they are willing to engage in practices that are now deemed outmoded and treated as war crimes. The only way for these adventures to turn a profit is to behave as the Romans or British did, to steal resources and consign the natives to something between genocide, slavery, and third-class citizenship. Therefore, all such disputes are more profitably negotiated than fought over. This is simply a mathematical reality, and our policies should reflect this. One corollary of the above is that it might make sense strategically in an individual case to allow a putative 4GW enemy to triumph and become the government, in order to more easily manipulate or conquer it as needed. 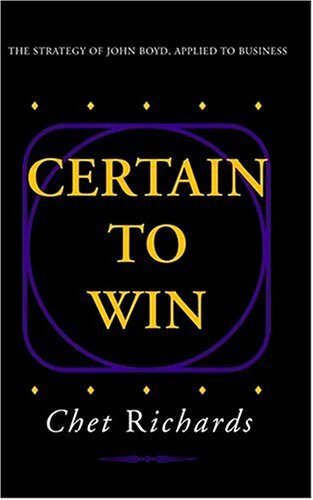 When insurgents win and become the establishment they have more to lose and are less willing to die, hence more prone to negotiation and more easily targeted, as they are forced to narrow the front and be more accessible by military actions. As an example it was far easier to overthrow the Taliban than it has been to eliminate them since they have been out of power. Lastly it is important to remember that there is no free lunch, all politics is local, geography is destiny… and difficult choices have to be made. Part of the morass of the Afghan region involves the silly border created by a Brit named Mortimer, and another part is the influence of the Indian-Pakistani dispute in Kashmir. The US tries to ally with both sides, who are working contradictory tactical approaches, and thus things never settle down. In some cases, then, and the Middle East is certainly another, the 4GW situation arises from the aftermath of colonization and is a symptom rather than a cause. The US should devote its efforts, assuming this area relates to vital interests, to getting its clashing allies India and Pakistan on the same side, at which point there will be little if any real problems in Afghanistan. Thanks. Emphasizes, again, that the solution to 4GW, whatever it is, is unlikely to have much to do with what happens on any battlefield. Unfortunately, as soon as we introduce the term “war,” most people start to think in terms of battles and fighter aircraft, etc. I remember an article seven or eight years ago that said that the reason we were having so much trouble in Iraq was that we hadn’t been able to bring the enemy to decisive battle, so that’s what we should be concentrating on. Turned out that the solution was much, much simpler: Declare victory and leave. Could one remove the state from the state vs non-state conflict. At least in the publics awardness? The state buys the services of non-state entity A to fight non-state entity B. Problems with atrocities by non-state entity A could be drowned in the legal system or just ignored. The Romans tried this. They hired mercenaries to fight their wars. As always happens, the mercs who conquer foreign lands for a pittance from the emperor grew tired of fighting for pennies and chose to cash in by conquering their paymasters. In 476 A.D., after being refused lands in Italy, German mercenaries under the leadership of the chieftain Odoacer captured and executed Roman magister militum Orestes and sacked Ravenna, the Western Roman capital at the time, deposing then-emperor Romulus Augustus. This was the final fall of the Roman Empire. When a state prefers to hire mercenaries to fight its war rather than sacrificing the blood of its citizens for its sacred principles, its end is nigh. Foolish American lawmakers and perfumed princes of the Pentagon, grotesquely ignorant of history, now toy with the same folly: see “U.S. Military Will Offer Path to Citizenship,”The New York Times, 14 February 2009. The Fall of the Roman Empire:A New History of Rome and the Barbarians by Peter Heather (Amazon) based on recent archeology digs has thesis that Carthage was the economic powerhouse of the western Roman empire … and when that fell to the Gauls (defensive troops had been transferred to save money since nobody thought Carthage was under threat) … then things started downhill fast. With loss of Carthage they ran out of funds to support the large standing army in Europe as well as the bribes and other payments that kept things from erupting. Eastern empire had sent troops for campaign to help the west retake Carthage, but had to pull them back when the Huns threatened from the east. The Huns then circled around to the north and attacked the rapidly weakening western empire. Composite bows allowed killing at longer distance than your opponent … the longer the bow, the longer the distance … however, bows from horseback were limited to about 100cm (w/o hitting body of the house). Hun invention(?) was asymmetric cavalry 130cm bow. Tom Clancy’s H.A.W.X. (Wikipedia) is a modern (fictional) example of what this sort of foolishness can lead to. Not sure that this is entirely uncommon. They’re called paramilitaries. Colombia used them in the 80’s and 90’s against the FARC. Gave them free rein for a couple of decades then slapped them on the wrist and de-mobilized them when the job was done. I agree. They are commonly used by governments — or powerful elements within the State — to do things that the State cannot be seen doing. For example, much of the violence against indians, blacks, and unions was done by such groups in 19th century US. And of course this is a sadly common feature of modern Latin America. 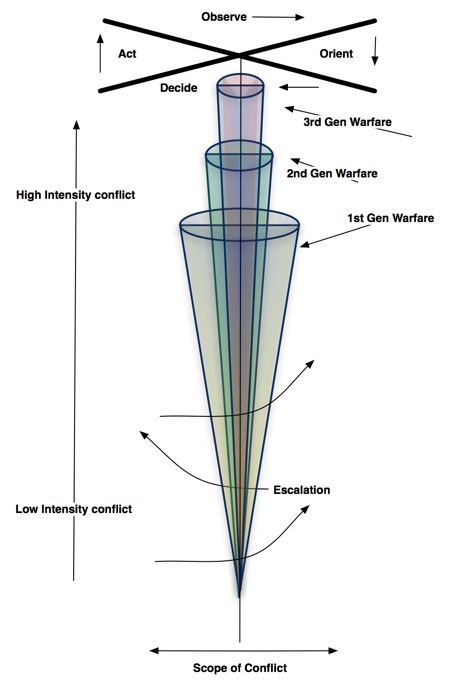 Chet’s “generations of war” graphic is superb. In the best tradition of those great 19th century infographics (and the 19th century truly was the Great Age of infographics, not the 20th!). 4GW by definition has been waged by non-state actors against nation-states. As Martin van Creveld points out, the essential purpose of 4GW is to destroy the moral and political legitimacy of the state, so the weakness of the perpetrator of 4GW is an essential part of the equation of 4GW warfare. “That, of course, was precisely the problem. In private life, an adult who keeps beating down on a five year old – even such a one as originally attacked him with a knife – will be perceived as committing a crime; therefore he will lose the support of bystanders and end up by being arrested, tried and convicted. In international life, an armed force that keeps beating down on a weaker opponent will be seen as committing a series of crimes; therefore it will end up by losing the support of its allies, its own people, and its own troops. Depending on the quality of the forces – whether they are draftees or professionals, the effectiveness of the propaganda machine, the nature of the political process, and so on – things may happen quickly or take a long time to mature. However, the outcome is always the same. He (or she) who does not understand this does not understand anything about war; or, indeed, human nature. It is therefore unlikely-to-impossible for a nation-state to engage in 4GW, since the nation-state is by definition large and powerful and has political legitimacy by means of its size and power. In order to wage true 4GW, a group must consist of non-state actors and be weak and lack the perceived legitimacy of a nation-state. If the current United States were to disintegrate into many different impoverished principalities run by local warlords, each with, say, an 18th-century GDP and economic level, then each of those fiefdoms might conceivably wage 4GW. But as long as the USA remains a group of united states and stays wealthy, with a large politically unified population who elect representatives as a whole people every 2/4/6 years (house, president,senate), it cannot by definition wage 4GW. It can only engage in the mass mechanized violence characteristic of the modern nation-state. As drone warfare strikes increase in frequency and technology, the strikes will increase in payload and area coverage, soon converging on WW II/Vietnam/Iraw-style carpet bombing albeit done by UAVs. That’s mass violence on a nation-state scale, not 4GW. Or so it seems to me. But Chet is the real expert on 4GW here, so perhaps he can correct me if I’m mistaken. I agree fully with your comment, but here’s an important distinction — one that is important and not commonly understood. It depends on the meaning of “engage”. I think you mean “successfully fight 4GW on foreign soil”. I can engage in atomic war — as a victim. Note that neither of these cases is “war” in any usual sense. As Chet mentions, 4GW is a broad concept and can include conflicts other than “war”. Thanks. Lots of stuff to think about. TX Hammes considers 4GW as “evolved insurgency,” which could be waged by states as well as non-states. He makes some strong arguments, and I’d urge anybody who is interested in the subject to read his book. So (I hate analogies, but don’t have anything better at this point …) if a state sponsoring an insurgency is like pricking its victim with an infected needle, then state-sponsored 4GW might be analogous to dumping malaria-infected mosquito larvae into the pond behind your house. To some extent, this may be what happened to Israel with Hamas — once the organism gets out into the wild, it can mutate or in some other way be difficult to control. On the other hand, Lind’s “survival of the state” description seems more promising of a new generation of violent conflict. What it says is that we’re entering an era of geopolitical MRSA. So let’s forget the Hatfield-McCoys model of conflict for a while and unite our efforts around this common (and more pressing) threat. That guy has a way with words. Acuanny not . . . but maybe it has become the domiNANT force. “Dominate” is a verb, while “dominant” is an adjective. Perhaps a part of the American indifference to whatever it is that those who dominate us do these days, until it is too late, is that a good education is no longer a dominant priority, the above being only one tiny example of how ignorant many of us have become as education has been dumbed down to the point of boredom, so that schools can turn out more and more docile workers rather than critical thinkers. You obviously attended, perhaps even graduated from, a far better school than I. It seems like poor form to criticize people for typos. Especially when the critic types something like “Acuanny not.” Chet has got a lot more authority and much better credentials and far more education on the topics he discusses than anyone else on this forum, IMHO. John Boyd did not pick people to carry on his work at random. Even I, often pedantic to a foolish degree, draw the line at criticism of typos and misspelling. In a world in which injustice and illogic rule, concern with such trivia is something we cannot afford.